Half of the Sky: Half of the Sky was brought to you today by the letter "H"...for "Happy"....and by the Number 3. Half of the Sky was brought to you today by the letter "H"...for "Happy"....and by the Number 3. Friday evening I made what might be categorized as an impulse purchase. I saw that Barnes & Noble was selling dvd copies of Sesame Street's "Learning About Letters" and "Learning About Numbers" for $9.99 each and, because I was unable to ignore the voices inside my head that frequently give me instructions my conscience...I bought both of them. I offer no apologies. These were the same two videos I used to own in VHS format...back when my kids were very little. Greyson and Tucker spent many a morning watching them clad in matching pajamas and their Bert & Ernie houseshoes. Wilder, on the other hand, only watched them until he was about three. After which he would point at the tv screen, shake his head vigorously and declare, "Not me!" "Not me! "...roughly translated, this meant that I was to turn off Big Bird and replace the video with one that depicted bulldozers, backhoes, garbage trucks and buildings that were being demolished with a wrecking ball. He would sit in front of the the television--only after buckling himself into his carseat--which should be placed on the floor like a real piece of furniture and treated like his own personal La-Z-Boy chair-- and settle down with a bowl of Goldfish and a sippy cup of milk. While our kids haven't been small for quite a while, we are light years away from having grandchildren. But? I didn't buy these videos for them. I bought them for me. Why? Because I find them relaxing and reminiscent of a sweet time in my life when things moved slowly. Because one can watch them from beginning to end and at no time is anyone cruel or bigoted or thoughtless. Every person has something of value that is brought forward and shared. And...because the universal language is--regardless of culture-- really just boiled down to learning about numbers and letters...no matter where you come from. All knowledge, whether you are acquiring it or dispensing it, is done so through letters and numbers. Only here is the playing field leveled and all are welcome to tread upon it. So tonight I confess I poured myself a glass of wine and watched as "The Count" counted to 20 in that ecstatic way he has with the Honkers. I watched a cartoon guy with a fiddle teach the value of the number 2. And Grover helped a little boy (or maybe it was the other way around) count to 10. All was right with the world and I reconnected with a time when three other little boys were content to sit in my lap and sing along...even though on this night I was alone. 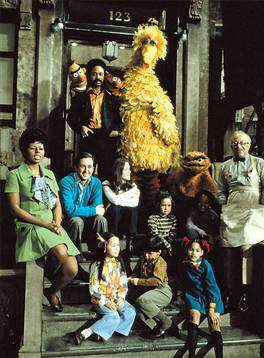 Sesame Street...it's a hard place to be anything but happy. So...what small and simple thing makes you feel good every time? And remember, there are no wrong answers to this question. Hmm, after a truly disastrous visit home this post made me weep.